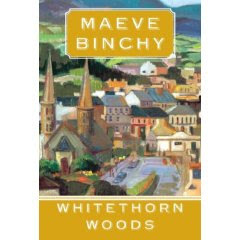 Whitethorn Woods by Maeve Binchy. She is my favorite Irish author. I have read all of her books and this is the latest. She has a wonderful way of drawing you into her colorful cast of characters that live through their tragedies and find a light at the end of the tunnel without being overly sentimental. Prep: A Novel by Curtis Sittenfeld. I don't know anyone who has read this but it looked like a fun, light read. It is about a girl suffering through an upper brow prep school education. Definite chick lit which is great for by the pool. A Thousand Splendid Suns by Khaled Hosseini. I was a big fan of The Kite Runner and from the reviews I have read this should be just as good. It has gotten great press and I am looking forward to this story about friendship between women. If you haven't already read Hosseini's first novel "The Kite Runner" you should it is extremely well written and moving. My Sisters Keeper by Jodi Picoult. I bought this book for my mother-in-law, Marilyn. She said she couldn't put it down and gave it rave reviews. It is the story of a girl who is born for the purpose of saving her terminally ill sister's life. Needless to say emotional strife and moral dilemmas abound. This may be my end of the trip read. I'll let you know what I think of these and the several others on my bedside table. If you have any books you think I should read please pass on the names to me. I love to get recommendations! It may take a village to raise a child, but apparently it only takes one bird to raise a flock. 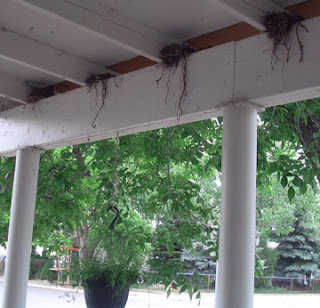 The girls and I have been watching the four nests built on our front porch. These nests apparently are tended by only one bird. She must have been one busy bird, and she will be even more busy when her four nests hatch eggs! We'll keep you posted when the eggs hatch! We are cleaning out the studio and have put together some fabulous treasures for you. 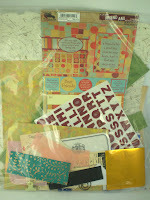 Our new art scrap packs are filled with great goodies. Each pack is one-of-a-kind! There are some great items in the packs that will really add to your art collage and assemblage projects. Each packet will hold a wide variety of items and no two packs are identical. We promise an eclectic and generous assortment of items. Look at our etsy store to see pictures of our art packs for sale. These packets would be great for card making, scrapbooking, collage, and other craft projects. Be sure to take a look! Okay, here are the directions for making the tray. Let me know if you have any questions and I would be happy to get back to you. Happy crafting! Step 1 -Develop a plan for where to lay out your memorabilia. You can lay them on your tray (with no Mod Podge) to see if they will fit; do any trimming now. Step 2 -Choose colored paper scraps for your base layer, be sure that they are the size, shapes and colors that you need. You can use lots of smaller ones for a more collaged effect. Step 3 -Begin adhering the paper to the tray. I generally coat the back of the paper with a thin layer of Mod Podge and lay it on the tray. I press to smooth out any bubbles. A bone folder is helpful in this step; or use my favorite tool: fingers. Repeat this step until you have one surface covered in paper. Step 4 -Apply a thin layer of Mod Podge over the covered surface. You may see some air bubbles at this point. Use your fingers to smooth them; most of them will resolve when the Mod Podge is dry. Step 5 -Let the surface dry until no longer wet, it may be slightly tacky to the touch. Step 6 -Repeat steps 3 – 5 until all the tray surface are covered with paper and sealed. Then adhere the messages or memorabilia in the same way the paper was applied. Step 7 -When you are satisfied with the look of your item, apply a thin, even layer of Mod Podge over the entire surface. Let dry. Repeat. I would suggest 2 – 3 coats in for an item that may be handled. You can apply multiple layers for a more durable surface. The Mod Podge will be dry to the touch in a few hours. It will take several days to “cure.” The surface can be cleaned by wiping with a dry or slightly damp (not wet) cloth. I hope you enjoy this project. I enjoyed making it, and I know the teacher enjoyed receiving it. Let me know if you give it a try! The end of the school year is jam packed with so many activities, my head is spinning. Regular field trips, end of the year field trips, literacy night, the learning fair, teacher appreciation week, and the other culminating activities are enough to make kids, teachers, and parents batty. Then you throw in the nice warm weather, Mother’s Day, and Memorial Day we all end up with spring fever! This year, I was the parent coordinator for the teacher appreciation gift for my eldest daughter’s 2nd grade teacher. I liked the project so much; I thought I would share it and the directions, so you could do this project, too. 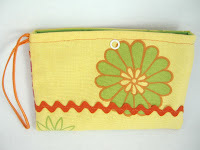 It would be a great gift for a teacher or grandparent, or even a wedding or baby shower. 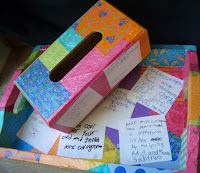 I made a decoupage tray (actually 2 trays, one for the teacher and one for the student teacher)and tissue box. In order to get ready for the project, I had each student write a message to the teacher. I provided an artist quality paper, cut in a 3 x 3 inch square and some archival, non-smudge, fine tip markers and pens. Each child had to think of their message, use their best spelling and handwriting, and sign their name. This was a wonderful part of the project. Each child put their best effort into thinking and writing something wonderful to their teacher. One child even wrote “You changed my life!” It can’t get much more heartwarming than that! When I took the messages home, I began assembly of the tray. Check back in tomorrow’s blog for step by step instructions. 1. I like using series and repetitive images. 2. I like sorting and grouping items. 4. I am a talker. I like to talk about the project while I am doing it and discuss my ideas --the opposite of Kerry, but she is a great listener. 6. My work is evolving...as is this piece, I am never sure that I am "done"
7. Mod Podge is one of my favorite mediums! So, there it is. I can't wait to hang our pieces in the studio! Let me know what you think, I always love outside input! Well, the art assignments continue now that we are almost done with the letter projects. Rachel told you all about her "H" piece. Now, you can see the completed "F." The best part of working on this project was working with my daughter Lauren. I asked her for some help in coming up with things that begin with the letter "F" and she just took off. I am trying to figure out how to use this hidden talent of hers. She came up with the most varied list of words that begin with "F." I put a portion of them written on the piece as well as having them represented in the collage. Also trying to represent emotions and action words in 3/D was challenging but great fun. Rachel and I tried to hide them from each other as we were working, bu,t alas the studio is small. We did our best to keep them a surprise and had fun looking at each of them to see if we could figure out what the other was thinking. See if you can spot all of the "F" words in my piece. We'll post Rachel's when it is completed and when they find their permanent hanging place in the studio. We are already at work on our next art "assignment." We'll let you know how it goes. The list goes on and on. Can you please send me any interesting H words you can think of to help me with my project? Stay tuned for photos of our completed work! Do you ever need an extra pocket? You know, you want to carry something, but don't want a big purse. Kerry and I have that problem every so often. We have a resolution to walk. We walk (or try to) each day we work in the studio. We take a 45 to 75 minute walk at least three times a week. We walk to the post office, to the antique market where we have our booth, and then around a nearby lake. The walking is for exercise, but it also gives us some time for chit-chat. Not just your normal chit-chat. We make plans, discuss our business, refocus our direction, plan our next line, and solve the world's problems in general. So, back to the problem of no pockets. 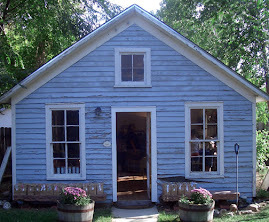 When we leave the house we need keys and our phones (in case one of the kid's schools calls). Sometimes, our oh so cute spring outfits don't have pockets. So we made a solution: pouches. The pouches have a handle so we can hook them over our wrists. They have a snap to hold in the stuff we need to carry. And, they are made of the cutest fabrics we can find! So, the next time you are running out of the house to solve the problems of the world, don't forget to bring your pouch!